The inventory system in Elder Scrolls Online is slot-based. Each character starts with 60 slots, which can be increased to 200 through pack upgrades and riding skill. Additional storage space is available at banks, where account-wide and guild-wide inventories can be accessed. Unlike in the single-player TES games, encumbrance is not a factor; each item takes up a single space, and it is not possible to become overencumbered. Instead, you will be unable to pick up any more items. Note that most quests reward an item, so you will need to have at least one free slot when turning in a quest, otherwise you will be unable to complete it. Certain items in the inventory can be stacked, while others can't. For example, crafting materials can be combined into stacks of 200, while siege equipment takes up a full slot per item. Items which are required for quests do not take up inventory space, and are stored under the Quest Items tab. Certain items, such as pets and costumes, are separate from the inventory and are stored in the account-wide Collections screen. Books that have been read are not picked up; instead, their text is listed in the Lore Library section of the Journal. By default, the inventory can be accessed on PC/Mac with hotkey 'I' or 'B'. It can be used to view information on items (stats, quality, stolen), change equipment, use consumables, or change your Quick Slots. The Quick Slots are primarily used for potions, food and drink, siege equipment and some trophies, and can provide quick access to eight different items. By default, the Quick Slots menu can then be accessed by holding 'Q' (PC/Mac), and can be used to quickly activate items in combat. Once an item is equipped, it frees an inventory slot, while its enchantment and trait and set bonuses, if any, become active. Equipped items are shown in the "Equipped" part of the inventory screen. Hovering over an item provides all the information about its type, stats, enchantment and its charge, set bonuses and the amount of wear it suffered. Together with seven apparel pieces, a maximum of four accessories can be equipped: one necklace, two rings and a disguise. Two weapon slots can be used for either two one handed weapons, one handed weapon and a shield or for one two handed weapon. Weapon swap becomes available at level 15. A separate tab exists in the inventory for Currency, although the amount will usually be displayed elsewhere on the UI when relevant. Character Bound - Items with this tag are bound to the current player and cannot be traded with other players or placed in your bank or storage. Bound - Items with this tag are bound to your account and cannot be traded with other players. However, you can place them in your bank or storage and transfer them to other characters on your account. 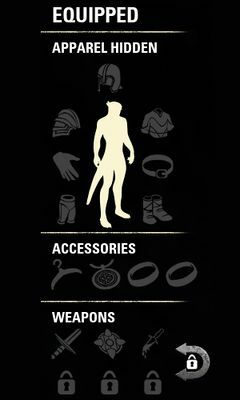 Bind on Equip - These items can be freely traded until you equip them, at which point they become bound to your account. Notably, most Set Items are Bind on Equip, including those you craft yourself. The only ones that aren't will be Bind on Pickup instead - used Set Items can never be traded. Bind on Pickup - These items are Bound to your account as soon as you acquire them. The one exception to this is that items found in Group Dungeons and Trials can be traded with other members of your group (even after the group splits up) for two hours after acquiring them. These will be marked with a icon. After the delay expires, they become fully bound. Backpack Bind on Pickup - These items are bound to the specific character that found them, and will become Character Bound as soon as you acquire them. Quest Items - These items are specific to a certain quest and cannot be traded. However, they do not take up any inventory space. If you abandon the associated quest, the item will be removed automatically. Collectibles - These items are bound to your account, but do not take up any inventory space. They do not even show up in the standard inventory screen but rather in the Collectibles screen. You can only acquire each of these items once and you can never lose them. They are available to all characters on your account but can not be traded. Some collectibles are found in Runeboxes, which can be freely traded, but once opened, the item becomes permanently bound to your account. If you receive a Runebox for a Collectible you already have, you will not be able to open it, so you should trade it to another player or sell it. ESO Plus subscribers have access to a separate, account-wide inventory for storing Crafting Materials. Craft Bags have a technical limit of 4.3 billion for each type of item, meaning that in all practicality the bag can hold infinite materials. Tabs allow the bag's contents to be sorted according to specific crafting skills, with separate tabs for trait and style materials. Bait can also be stored in Craft Bags, and is categorized into the Provisioning tab. Should your ESO Plus subscription lapse, the items within will remain accessible but no new items can be deposited in the bag. This page was last modified on 25 November 2018, at 15:11.